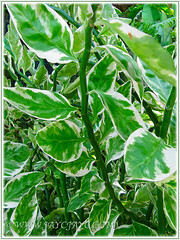 A stunning plant with fabulous variegated foliage and attractive pink or red flowers. Its zig-zag stems are an added attraction too. It is popularly grown for its unique, interesting and curious form. However, if you’re one of those people like me who’ll experience skin rashes when in contact with its toxic milky sap, it’s advisable to avoid it at all cost. On the other hand, if you’re still desirous for it, just remember to wear gloves when handling it. 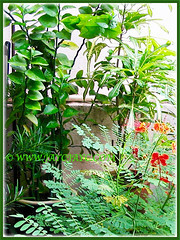 Euphorbia tithymaloides with green leaves as shown in the left image, had graced our tropical garden slightly more than a decade ago. Unfortunately, it had to be removed pronto when it showed its beastly self, causing skin rashes on my palms and hands when I had to prune off some of its straggly stems. Well, I could have worn gloves when handling it but I tend to forget oftentimes and it can be rather cumbersome too. Therefore, it is a definite no-no for us no matter how beautiful or captivating it is. We just have to be contented, gazing adoringly at them in other peoples’ garden! Botanical Name: Euphorbia tithymaloides ‘Variegatus’ (syn. 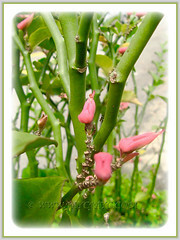 : Pedilanthus tithymaloides). Common Name: Variegated Devil’s Backbone, Jacob’s Ladder, Zig-zag Plant, Redbird Flower/Cactus, Christmas Candle, Slipper Spurge/Plant, Japanese Poinsettia. Etymology: The genus name, Euphorbia was named after Euphorbus, the Greek physician to Juba II, King of Mauretania. The species epithet, tithymaloides is derived from the ancient name used by Pliny the Elder to describe a Euphorbia, Tithymalus, which resembles the plant. Origin: It is native to subtropical and tropical Florida in North America, Mexico, the Caribbean, Central and northern South America. Plant type: An ornamental, herbaceous and perennial shrub. Features: Euphorbia tithymaloides is from the very large and diverse genus, Euphorbia that consists of more than 2,000 species of flowering plants. 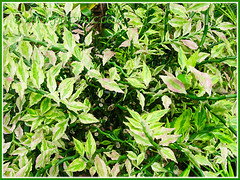 ‘Variegatus’ is a cultivar with attractive variegated foliage. Moderately fast-growing, this small to medium-sized perennial and herbaceous shrub can reach about 2 m in height. 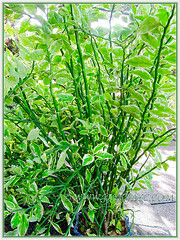 A hardy plant with brightly coloured variegated leaves, about 3.6-7.6 cm long and 3-4 cm wide. The thick and glossy leaves are glabrous, lance head-shaped with acuminate tips and have undulated to entire margins. Each leaf is sessile and arranged alternately along the stems. 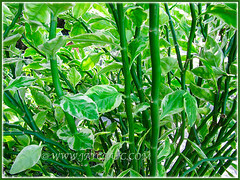 The variegated foliage are coloured variably in green, white, cream to pale yellow or chartreuse and flushed pink or red, depending on the intensify of sunlight or light received. Stems are glabrous, stout, succulent and darker green in colour. 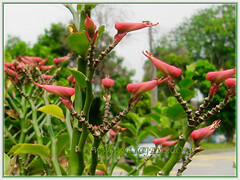 They are rather erect to spreading and zig-zag growing, resulting it to be commonly known as the Zig-zag Plant. The stems are slightly swollen subtending its foliage. Euphorbia tithymaloides ‘Variegatus’ produces bisexual flowersin bright pink or red. The fleshy bract-cups are slipper-like or bird-like in shape, and are only open at the tip. They will be followed by ovoid-shaped seed pods. 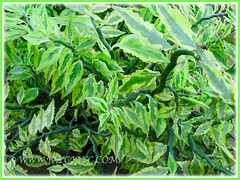 Culture (Care): Euphorbia tithymaloides ‘Variegatus’ or Variegated Devil’s Backbone as commonly named, grows with moderate care. Light: Grow outdoors in full or partial sun and if grown as a houseplant, provide sufficient bright light. Moisture: Low to moderate water requirement. Though it is drought tolerant, defoliation may occur if not watered for too long a period. It does benefit from regular watering. Allow top 5 cm of soil to dry out between waterings. Others: Foliage colours seems to be light dependent. Leaves will be suffused with pink or red in full sun or bright light. Hard prune as needed to get a bushier shrub. growth. Feed once monthly with a balanced liquid fertilzer. Caution: Stems, leaves and roots will exude a milky toxic sap when broken and will cause skin allergy/rashes in certain individuals. Hence, handle with extra care and wear gloves if necessary. No serious pest or disease but watch out for mealy bugs and powdery mildew. A beautiful shrub to plant in tropical and subtropical regions. It is cold hardy at -1°C with light frost or short cold spells in protected areas.Provide sufficient sunlight outdoors and bright light if grown indoors as houseplant. 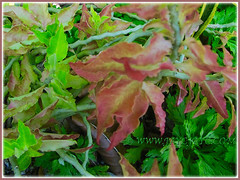 The variegated leaves take a pinkish tint during cooler weather. Water moderately from spring to autumn but keep fairly dry in winter. It flowers from mid spring to summer in good growing conditions. 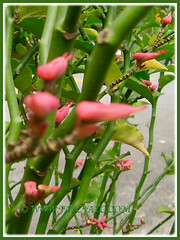 Propagation: Can be propagated from seed or cuttings, the latter being preferred. Stem or tip cuttings, measuring about 15 cm long should be taken above a joint. Allow the cuttings to dry out before planting. Usage: Undoubtedly, Euphorbia tithymaloides ‘Variegatus’ will be an excellent ornamental specimen in any garden with its extremely impressive variegated foliage. It is ideal as a fabulous low shrub in a flower bed or border, as well as among other drought-tolerant plants in a rock or desert garden. These attractive shrubs can be grown en masse to create low hedges for some privacy. 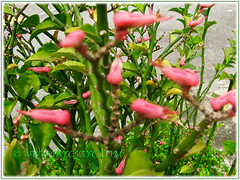 Grow it if you’re a nature lover as hummingbirds are attracted to the plant’s flowers. On the downside, Euphorbia tithymaloides contain toxic latex that can cause skin irritation and eye inflammation. Its toxic juice can cause nausea, vomiting and diarrhoea when ingested. Nevertheless, in folklore medicine, different parts of the plant are used to treat various ailments and illnesses, though none have been scientifically proven effective. Also, the plant is being investigated as a potential use as renewable resource of plant hydrocarbons and petrocrop. You’re most welcome, dear Yara. Have a lovely Monday and great week ahead. Hugs! !